Join NARSA for just $25! 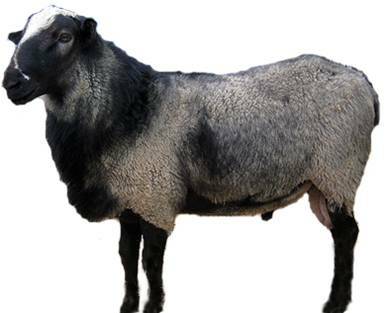 The lambs are all black at birth and then turn gray as a result of a mixture of black and white wool fibers. Males have a mane of long black hair around the new and down the brisket. The head is small and angular, the poll is round, ears are upright and mobile. The eyes are voluminous. Males, which are usually polled, have a more convex forehead than females and a wider and shorter head. The body is of medium size and the ribs are rounded. The Romanov animal is high on its legs. The tail and short and very characteristically pointed. The average body weight of the mature animal is 100-150 lbs for the ewes and 150-180 lbs for the rams. The Romanov breed is characterized by an extremely long season of sexual activity. In most instances, the ewes have no anoestrous period at all. Ewes return to oestrus 30 to 40 days after lambing. Because gestation length in the Romanov is a few days shorter (averaging 144 days with a range of 139 to 149 days) than in most other breeds, it is possible to manage a flock of Romanovs to produce two crops of lambs per year.In the Soviet Union, the average number of lambs born to 100 ewes ranged from 184 to 320 lambs in different flocks depending on their condition. In many cases, ewes give birth to 3 to 5 lambs at one time and have occasionally had as many as 7 to 9 lambs alive. One ewe was reported to have given birth to 64 lambs in 12 lambings. 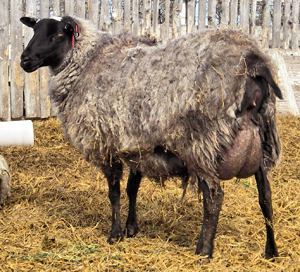 The high prolificacy of the Romanov results from a higher percentage of ewes producing triplets and quadruplets rather than few ewes producing exceptionally large litters. The average number of reproductive years in the herd is about 7.5 years. The Romanov ewes are excellent mothers and produce milk adequate to feed the triplets and quadruplets they birth. Both the prolificacy and mothering abilities are passed on to the crossbred offspring, in turn increasing their value. Many breeders have found that a ½ and even a ¼ blood Romanov will produce twins and triplets consistently with little or no assistance and are able to raise their offspring themselves. Sexual maturity is early in the Romanov. Males are capable of mating at 3 to 4 months of age; some ewes were reported to have lambed at nine months of age. Well-fed females can reach 85 to 90 lbs live weight in six to eight months and can be bred at that time.